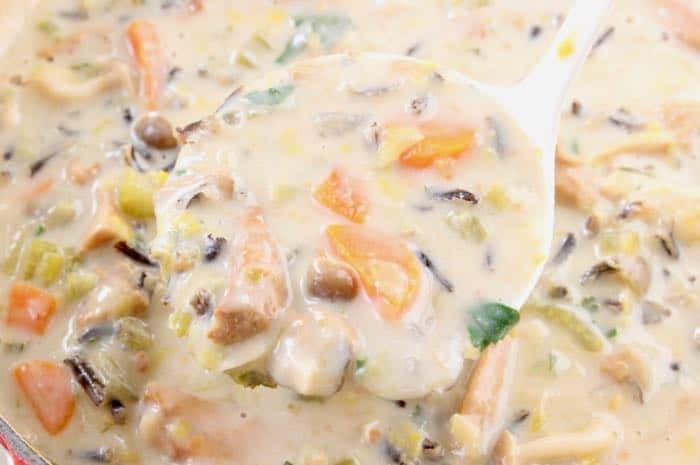 Easy and extra creamy wild mushroom wild rice soup recipe that is comforting, warming and filling. Made with a mix of wild chanterelle mushrooms, hen of the woods, a small bunch of enoki, lots of leeks and a splash of white wine. I wanted to create a variation of the cream of mushroom soup “ Zuppa di Funghi ” from last week that didn’t call for coconut cream. So I made a quick cashew cream instead to take it to the next level of lusciousness and silkiness but with more of a classic flavor. 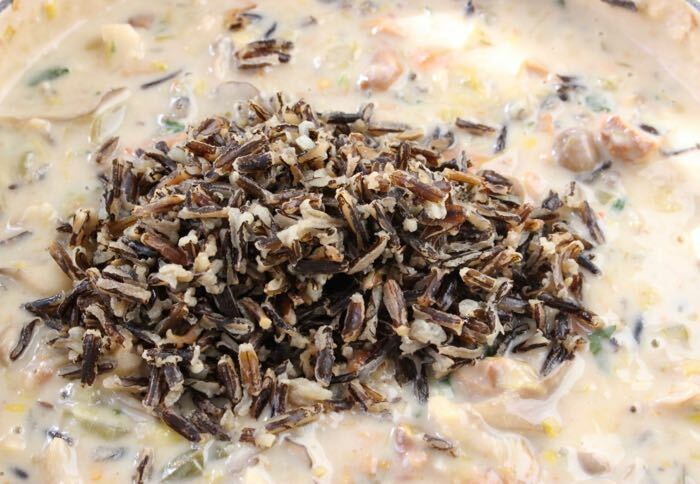 The Best Wild Mushroom Wild Rice Soup Recipe Ever! 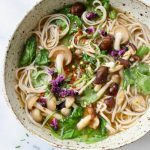 Never mind there are at least a handful variations of mushroom soups on this blog already but who’s counting ? Mushrooms are life, can’t stop, won’t stop, love them all! 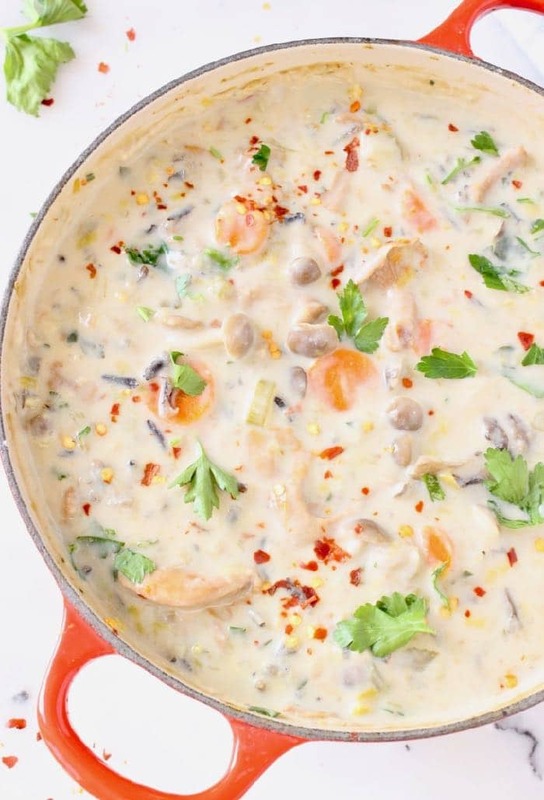 Leeks, carrots, celery and garlic form the deep flavor base in today’s variation that you build on with your very favorite mushrooms. Chanterelles taste like chicken so I like to take advantage of them while they are in season and decently priced. 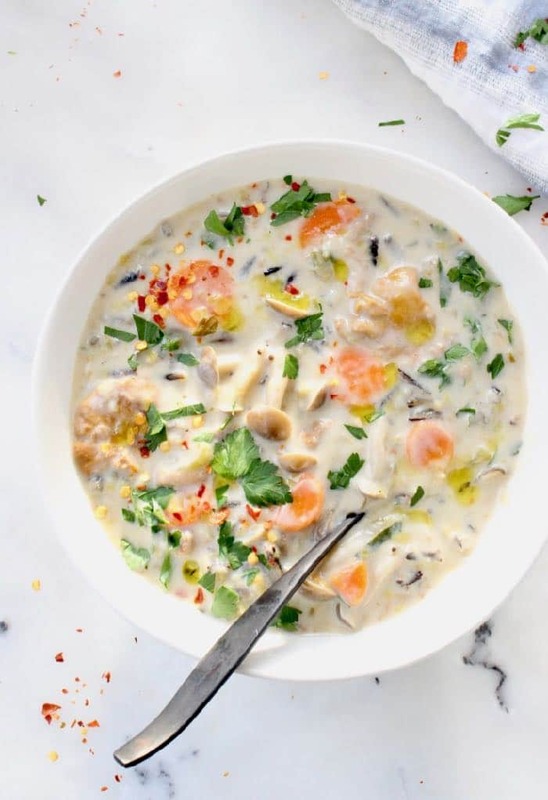 Depending on the variety of mushrooms you are going to use this soup has the potential to taste a bunch of different ways. If you are a fan of pot pie this combination is your best friend. Ladle the soup into some oven proof bowls and top them with a sheet of puff pastry. 15 minutes later voila: the ultimate vegan pot pie in your face! Otherwise it’s WFPB and oil-free goodness. In hindsight I wish I added some broccoli florets into the mix as the flavors would compliment each other perfectly. So throw some in there to boost the nutritional value if you have some, even kale and spinach make a good addition. It’s important to cook the rice separately and add it to the soup as you serve it, unless of course you plan to consume it all in one sitting. If you allow the rice to sit in the soup it’s just going to absorb it all and you’ll end up with some type of risotto dish the next day. Really tasty but not exactly the soup you had in mind. Good to know: Wild rice is actually a semi-aquatic earthy grass native to North America that grows right here in California during the summer months and is harvested in the fall. 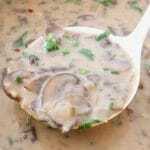 Creamy wild mushroom wild rice soup recipe with leeks and wine, comforting, warming and filling. Rinse the cashews well and steep them in hot water for 25 minutes. Drain and rinse again then add them to a powerful blender with one cup of water and the juice from half a lemon. Puree until smooth and creamy. Refrigerate until needed. Rinse and drain the wild rice in a couple of changes of water. Bring 2 1/4 cups of water to a boil, add a pinch of sea salt and the wild rice. Bring back to a boil, turn the flame down to low and cover with a lid. Simmer for 45 minutes until all the water is absorbed. Remove from heat and allow to sit covered for 10 more minutes before fluffing with a fork. Set aside until needed. Preheat a heavy bottom soup pot over medium heat. Add a splash of veggie stock and the leeks with a pinch of salt. Saute until wilted and the leeks start to get a little color. Keep a close eye on it and add more stock as needed. Stir in the red pepper flakes, carrots and celery together with the bay leaves and thyme and continue cooking until they start to soften. Sir in the garlic and cook just until you start to smell its fragrance taking care not to burn it. 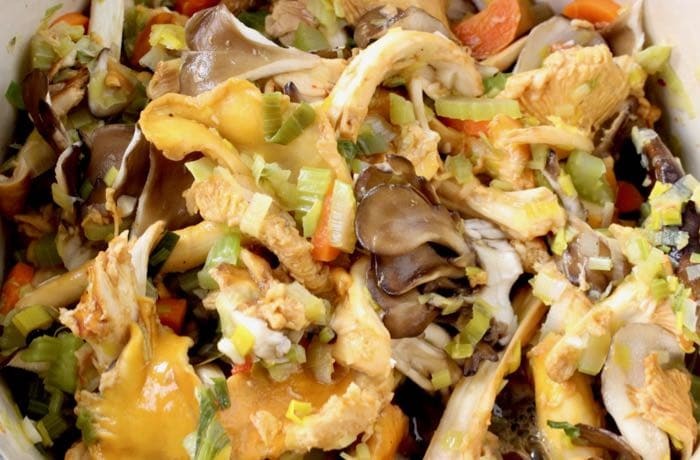 Depending on their size make sure to tear the mushrooms into smaller pieces if needed and separated the hen of the woods and enoki varieties from the cluster. (If using shiitakes make sure to discard the stem as it is tough and woodsy). Add the mushrooms to the pot and give everything a good stir. 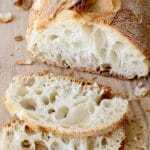 Allow to sweat until they release their moisture and it evaporates almost completely. Stir the onion powder and the white wine. Bring to a simmer and bubble away until all the liquid has been absorbed. Meanwhile warm up the veggie stock and whisk in the chickpea miso until incorporated. Sprinkle the flour over the mushrooms then pour in the miso veggie stock. Bring to a simmer and cook for a good 10 minutes until the soup has thickened. 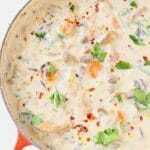 Add the cashew cream, taste and adjust seasonings with the sea salt and black pepper. Stir in the wild rice and remove from heat. 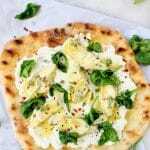 Sprinkle with fresh herbs and serve or ladle into oven proof bowls and top with a sheet of vegan puff pastry to make pot pies. You can substitute the wild rice in the recipe with barley, farro even lentils. This was SOOOOOOO fantastic. It will be a new family favorite. Hubby is an omni and is enjoying his bowlful right now. Thumbs up! 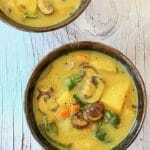 This soup is so delicious! I decided to make this even though I only had golden oak shiitakes and baby bellas. 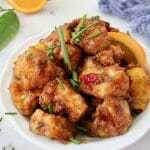 This was very easy to make but has flavors that will make your taste buds happy. Love! I will definitely make this again and again. I love this soup. It was the prefect meal for a cold winter day. I can’t wait to have leftovers tomorrow.